Corolle's Mon Classique Cherry High Chair for ages 3 and up is actually two accessories in one: A high chair with snap-on tray that easily converts into a chair and desk set. The Mon Classique Cherry High Chair fits baby dolls up to 17 inches tall (sold separately). Corolle's Mon Classique Cherry High Chair is a must-have addition to any baby doll's nursery and ideal for multi-tasking make-believe moms and dads. 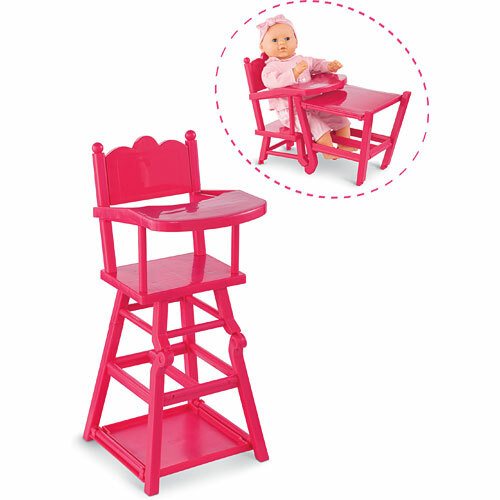 Two accessories in one, the High Chair is perfect for seating a favorite baby doll up to 17 inches tall comfortably at mealtime; simply fold its "legs" and it becomes a chair and desk set. Little ones love taking care of their baby dolls the way their parents take care of them. Designed in France, the Mon Classique High Chair is part of Corolle's Mon Classique Collection that offers everything ages 3 and up need for nurturing pretend play with their favorite baby doll, whether it's dressing, feeding, on the go, at bath time or at bed time. Corolle's Mon Classique High Chair is the winner of a Platinum Seal Award from The Oppenheim Toy Portfolio, the only independent consumer review of children's media. Award winners are selected based on their quality, innovation, and ability to provide children with an engaging play experience. The Platinum Seal Award is The Oppenheim Toy Portfolio's highest honor.